Is The Folding Klarfit X-Bike Azura Pro Sturdy Enough For Newcomers? Some X-frame exercise bikes aren’t all that much to look at, but the Klarfit X-Bike Azura Pro is quite appealing with its strong lines, curves and a choice of colour combinations. 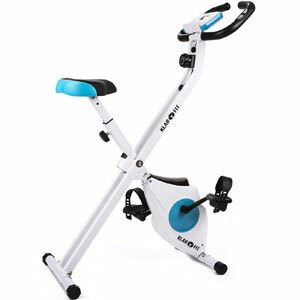 This model is sold as space-saving, gentle machine for basic fitness and fat burning. Does it do enough to satisfy users? Does The Klarfit X-Bike-700 Foldable Exercise Bicycle Offer The Performance That Buyers Are Looking For? In some ways, the Klarfit X-Bike-700 Foldable Exercise Bicycle looks like your typical modern X-bike. It has a selection of fun colour schemes, a simple folding X-frame for storage and a typical set-up. Then there are the subtle differences that make it a little more appealing and accessible, such as the simple shape, backrest and padding around the seat and arm rest. 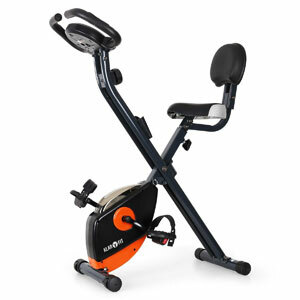 This exercise bike looks like a good introductory option for users with some great additional features. Is this the case?